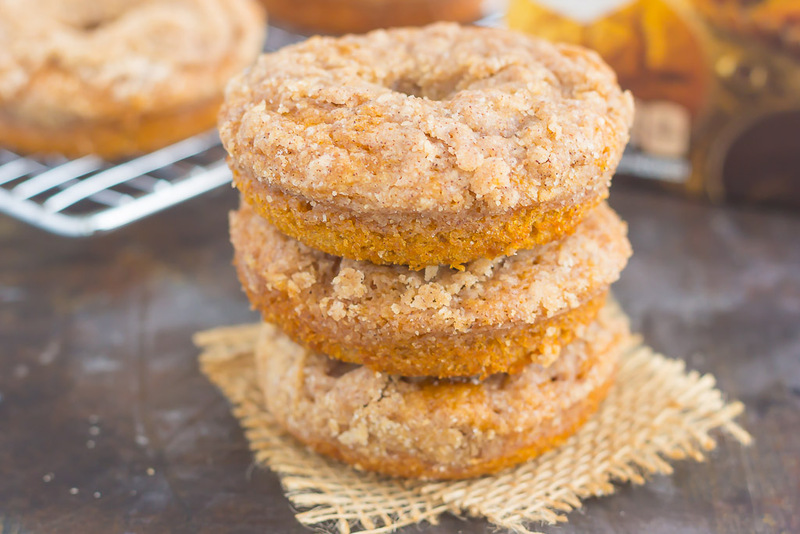 These Baked Pumpkin Streusel Donuts are soft, fluffy, and bursting with pumpkin. Filled with cozy fall flavors and topped with a sweet cinnamon streusel, this easy treat is the perfect fall breakfast or dessert! Now that we’re almost into mid-October, I’m really trying to appreciate the season. I know I say this all the time, but this year is flying by way too fast! When was the last time that you really stopped and tried to live in the moment? This is always something that I say I need to do more often, but then life gets the best of me, and I just continue on, without appreciating what’s right in front of me. I’m trying to make a more conscious effort to appreciate the little things in life, and to be more present. And that means that October is filled with lots of pumpkin, lots of comfort foods, and a lot of fun, too! Can you believe that Halloween is just a few short weeks away? Whether you celebrate the tradition or not, you can’t ignore all of the reminders of the spooky day. Costume shops have been popping up in my area since the end of August, and all of the stores have had their decorations and candy out since then, too. Even though that was way too early for my liking, I am enjoying all of the sights now. And even though my days of trick-or-treating and dressing up are long gone, I still love to get into the Halloween spirit. Passing out candy to the ghosts, goblins, and princesses in my neighborhood is my favorite thing to do! Besides, eating all of the candy that I bought, of course. Along with passing out candy, I’m starting a new tradition this year. Donuts! But, not just any donut. Baked Pumpkin Streusel Donuts. After all, what goes better with fall (and Halloween) than some pumpkin-y, donut-y goodness? And you know me, I’m all about those baked donuts! Easy to make and healthier than the fried kind, they steal my heart every time. 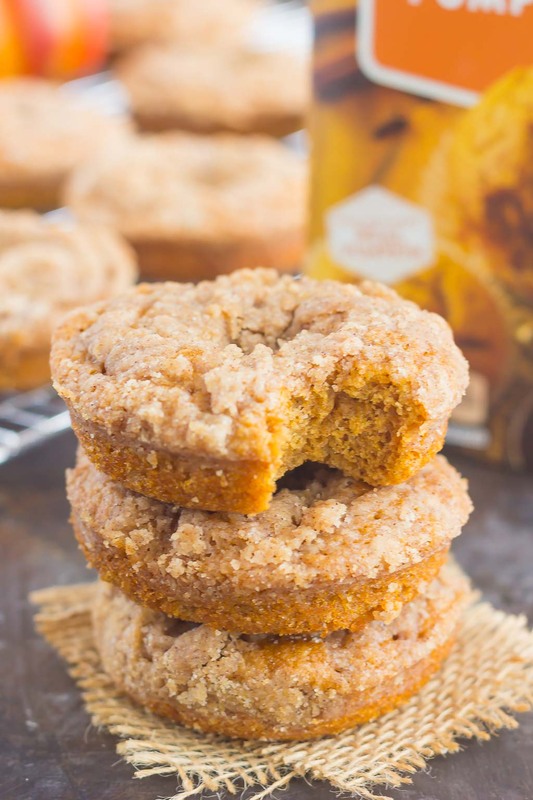 And because it’s fall and almost Halloween, I thought these Baked Pumpkin Streusel Donuts would be a delicious treat to share. I plan on eating a few (or all) of them while passing out candy to the kids in my neighborhood. 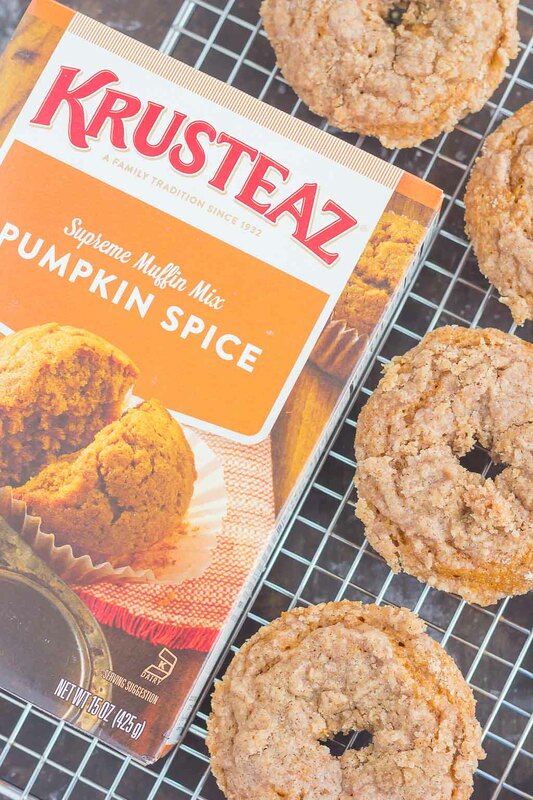 Thanks to Krusteaz Supreme Pumpkin Spice Muffin Mix, these donuts are extra easy to make and extra delicious. 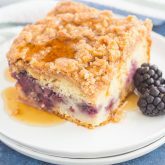 And just incase you couldn’t tell from this Blueberry Almond Poppy Seed Muffin Trifles or that Blackberry Streusel Pancake Casserole, Krusteaz is my favorite for whipping up a variety of baked goods. 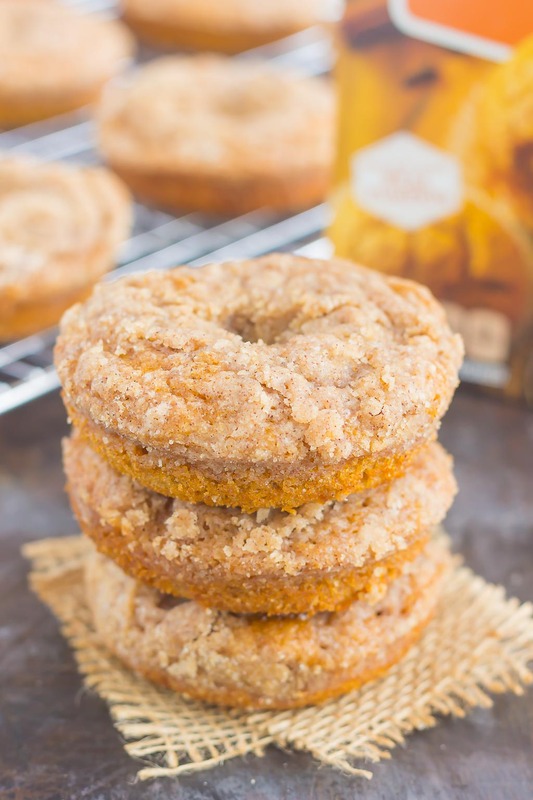 Trust me, friends, these Baked Pumpkin Streusel Donuts are the ultimate pumpkin treat. They bake up soft, fluffy, and filled with just the right amount of flavor. And that cinnamon streusel topping is the perfect touch! 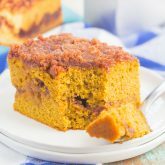 It’s slightly crunchy, sweet, and delicious when paired with pumpkin. 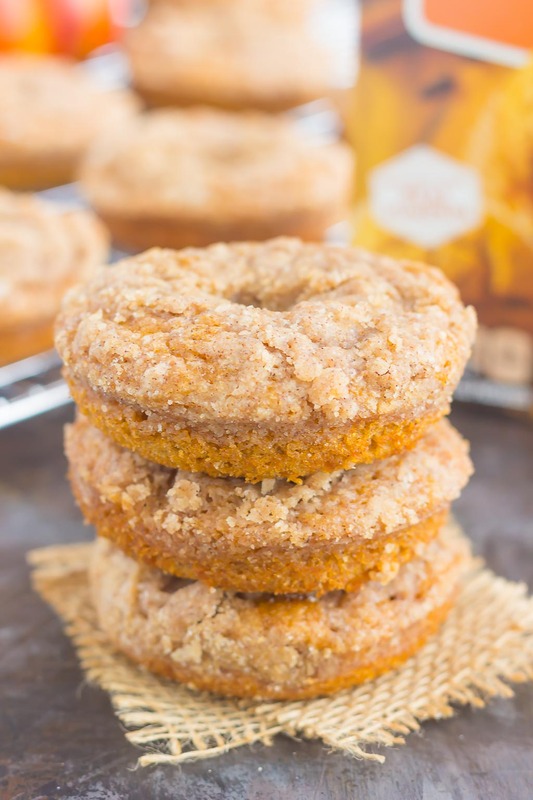 So grab the ingredients and whip up these easy Baked Pumpkin Streusel Donuts today! 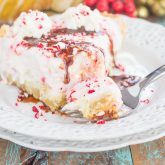 Perfect for fall and Halloween, this treat will be a hit with everyone! These make me so happy! And they look so perfectly easy to make, too! I can't even believe Halloween is so close... Can't wait to decorate my home this weekend and do a TON of fall baking! Thanks, Sues! These really are the easiest (and tastiest) donuts to make. And yay for fall baking! These look great! My daughter and I LOVE pumpkin everything so I'll definitely be giving these a try! Thanks! Thanks for the sweet comment and for stopping by, Anna! I'm trying to live more in the moment too. Time is just going by way too fast and I know we're going to blink and it will be Christmas! Scary thought. :) These donuts and a cup of coffee would be the ideal way for me to savor fall -- these look delicious Gayle! Time goes by way too fast! Thanks for the donut love, Marcie! Living in the moment is pretty imperative, because time goes by entirely too fast! I can remember last Christmas like it was yesterday, and before you know it, it will be here AGAIN! Which is just crazy!! I am loving these donuts, Gayle!! 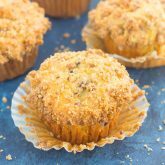 Streusel is my weakness, so I wish I had a few dozen of these in front of me for breakfast! So yum!! Pinned! Cheers!! I totally agree...time is crazy! :) Thanks for the donut love, Cheyanne! It surely is important to live in the moment, but sometimes easier to say that to do! It's a work in progress for me, especially knowing when to take a break from social media, especially in the evenings. Streusel on anything instantly makes whatever it is better. And that's saying something for these donuts because they sound completely delicious even on their own. Wish I had one for b fast right now ;) Pinned! Cheers to a lovely weekend, my friend! Agreed! Living in the moment is so hard for most people. And YES to streusel! Thanks, Dawn! I'm a glutton for streusel! Oh man, these look good! I'll take a baker's dozen, please!! Pinned! Wow, these donuts look fantastic! Love them! Can't wait to find this muffin mix and try them! Love the streusel! Donut worry, I can finish any of these that are left over. :-) These look incredible!